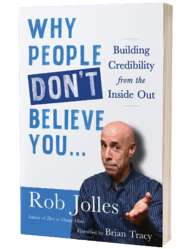 Why People Don't Believe You: Building Credibility from the Inside Out is my sixth book, and in this vein, I profoundly believe in the power of books to enhance the key learnings of my workshops, trainings, and speaking. My books are like my children; I love every one of them. But Why People Don't Believe You… is personal. This book is about finding the necessary magic to help others believe you. It has the ability to help not just those who struggle with this issue or those who have lost hope, but also so many more of you who are one or two setbacks away from losing your confidence as well. We can all get there; it's just a matter of learning the right tune. The following is an adapted excerpt from Why People Don't Believe You: Building Credibility from the Inside Out. This book offers proven and practical steps to projecting the confidence and credibility you need to succeed. In order to do this, we have to first recognize that credibility is as much about attitude as it is about aptitude. So-called "soft skills" like pitch, pace, and tone of voice are actually some of the most crucial factors in determining how people perceive us. It's not the words; it's the tune that really makes us memorable and credible. Oh my, how we love our words. We learn to write them letter by letter, then form them sentence by sentence, then assemble them paragraph by paragraph, and continue page by page. At one moment, we can make people laugh at them and, at another, make people cry at them. We have been raised to believe that words are one of the most essential tools an individual can use to communicate. Well, I say we have been sold a bill of goods. We've been duped. If words are so important, why are so many of us literally afraid to send a text or an email because we are nervous that our words will be misinterpreted? Could it be because our words alone offer little in the way of help when it comes to conveying the true emotional content of what we are trying to say? I am not suggesting that words don't have their place, but I contend that their place is overrated—way overrated. The fact is, a huge percentage of the population struggles with an issue that has very little to do with the words we use: the simple act of being believed. We can find ways to mask this problem, but it haunts us just the same. We take jobs that don't require face time with clients, but we can't avoid interacting with members of our team. We avoid social situations that make us uncomfortable, but certain get-togethers cannot be avoided. We can't get others to believe us because we don't believe ourselves. It's not the words that betray us; it's the way the words are used. I call that the "tune." Listening to words is like watching a magician work his or her magic. The magician wants your attention to be in a certain place and will go to great lengths to keep your attention on a prop—but that distraction is to keep you from looking at what the other hand is doing. Words are where your attention may be, but the tune is where the magic happens. Berrett-Koehler author Rob Jolles delivers down-to-earth solutions for anyone looking to enhance the most basic need of all—to be believed. He leverages his over 30 years of experience to equip readers with empowering, practical tools for achieving business and social success.